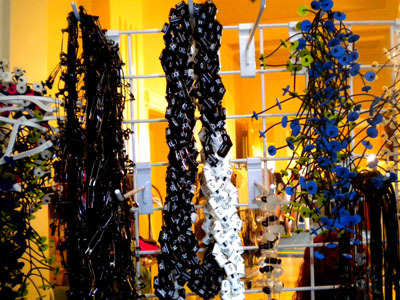 The Pasadena Bead and Design Show is held twice area in the beautiful city of Pasadena, California. I am fortunate to live just 30 minutes away, Kayla and I spent a day just looking, getting ideas and talking with talented jewelry makers and artists. 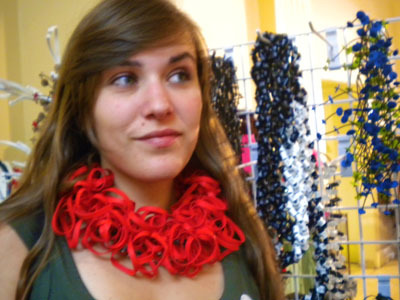 One of the exhibits there is by fiber artist Barbara de Jounge, and what intrigued me the most is the recycled necklaces. Can you believe they are made out of rubber bands? 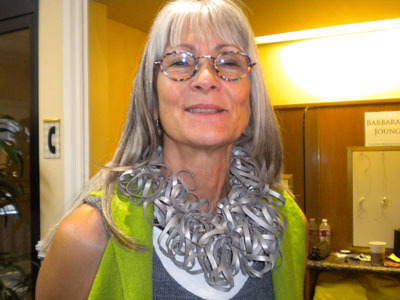 Barbara also works with wools and makes eclectic cutting edge designs. The necklace on the right is made out of felted wool, and on your left is made out of safety pins, sorry guys it is so hard to take a picture when you have no control of the lights. Re use, recycle, refurbish, turn something ordinary into extraordinary! I am a daring person and I love big necklaces! I would wear any of them! These are really interesting and certainly a lot of fun. But you would have to have a lot of courage to wear this in public. You are lucky to live in the Los Angeles area and to have so many events near you. We moved from there over 20 years ago and I still think of it fondly.